At 0600 on May 4, 1945, Ensign Kinji Yamamoto took off from Ibusuki Air Base as radioman in a three-man Type 0 Reconnaissance Seaplane (Allied code name of Jake) carrying an 800-kg bomb. He was a member of the Kamikaze Special Attack Corps 1st Sakigake Squadron. He died in a special (suicide) attack off Okinoerabu Island at the age of 23. He was from Hyōgo Prefecture and had been a student at Waseda University in Tōkyō before entering the Navy. He was a member of the 14th Class of the Navy's Flight Reserve Students, and after training he became a member of the Kitaura Air Group in Ibaraki Prefecture. I now have come to Takuma Air Group . This month on the 12th I came from Kitaura to this place as a member of the Special Attack Corps, and finally tomorrow (29th) I will make a sortie. I caused many troubles for 25 years . Moreover, I have not repaid in any way your kindness to me. All is for an eternal cause. There is not anything specific to say as a will. Just please give my warmest regards to Hamamoto. I would like you to do this though I think you have no relationship to him. Do not forget that I went to my death smiling on the Emperor's Birthday  in 1945. I will attack the target of an enemy ship. It has been a very long time since I have written to you, and from you please give my best wishes to others. Give my regards to everyone. The last time to get together was when I met with Mother and Older Brother Kazuichi last year on October 25. Take good care of Hikomi and Jūichi. Chieko also, do your very best. Older Sister Shigeko also, take care. Since it would be endless if I list names one by one, please handle greetings for me. The letter comes from Matsugi (1971, 186-7). 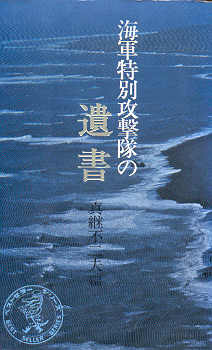 The biographical information in the first paragraph comes from Matsugi (1971, 186) and Osuo (2005, 237). 1. Takuma Air Base was located near Tadotsu Town in Kagawa Prefecture. 2. The traditional Japanese method of counting age, as in much of East Asia, regards a child as age one at birth and adds an additional year on each New Year's day thereafter. This most likely explains why the letter indicates his age as 25 whereas the current way of counting age based on his birth date in Matsugi (1971, 167) indicates that his age was 23 at time of death. 3. Emperor Hirohito's birthday was on April 29.